I’m a Digital Humanities and Women’s & Gender Studies Master’s Student at The Graduate Center, CUNY. My degree will be in an Individualized Study called “Mother Studies.” I hope to submit my thesis for review during the spring 2015. Currently this project has five main components. 1. “Electric Mommyland” is a written paper for Hester Eisenstein’s Sociology of Gender Class. I use this paper as the premise for the first of what I hope will be many projects called “Mapping American Motherhood” online. Read more. 2. “Mapping American Motherhood” is a project for my Digital Humanities class. 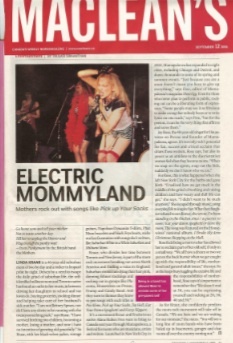 “The Electric Mommyland” paper will become a digitized collection of music, images, sound bites, film clips, and press stories, that will connect a North American popular culture movement with an intellectual movement happening simultaneously in Canada. Read more. 3. Matri-Theory is an attempt to “theorize motherhood” in a way that can help neutralize the emotional attachments we all feel for our mothers, or for our experience of being mothers. The reason why I think its important to be able to do this is when we talk about mothers, we are all speaking about different conditions. If we are to introspect on motherhood, we must first agree that we are talking about the same thing. Read more. 4. For my thesis I will be introducing a Matri-Theory, demonstrating a bit of the history of the mother’s movement through Electric Mommyland, and arguing for a place for Mother Studies within the academy. 5. Process blog. Read more. Please come back and check my progress, and please do contribute feedback, add comments, or contribute to this work. You can respond directly here on the website, or write me: MarthaJoyRose@gmail.com. Your comments will a) be anonymous, or b) credited (which ever you prefer).